Is there a lack of boys clothes? Am I the only one that thinks there is a lack of young boys clothes and shoes? It’s something that really bugs me. 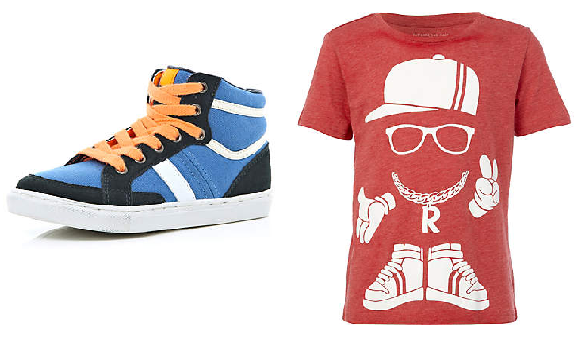 The boys clothes are for the majority plain and colourless, who says boys can’t wear colourful clothes? I have just been looking on River island and managed to find a colourful pair of boys shoes – miracle. I also found a nice red top but when looking in comparison with the girls clothes there is a lot less and it mostly follows the same colour chart -dull. There seems to be so much more available for girls compared to boys. Our local Next store has a lot more choice for girls. This is more evident when there is a sale as there are rails of girls clothes and usually a rail or two maximum for boys. So what is happening? Are there less people making boys clothes than girls? Am I looking in the wrong place? Is it all in my mind? should I just be happy with the choice’s we have? Where do you shop for boys clothes? I would love to know if you have found a fantastic online sites with good quality colourful clothes. So I would love to know.. am I alone in thinking this or do you think so too? We went into Next and there were 2 rails for boys and about 15 for girls! I know us girls have extras like tights, skirts and dresses which I think is why there is a lack of clothing for boys. That might be part of it too Rachael thats not something I’ve really thought about. I just find it so hard getting nice colourful clothes for him. There IS so much more choice when it comes to girls clothes. Tesco is sometimes alright although there are still WAY more girls clothes than boys. I am forever disappointed with the offering for boy’s clothes. Usually a small section for boys and loads for girls. When I was footwear shopping there were so many for girls and just a few for boys, boring designs too. Companies online are much better but usually too pricey. I agree in that H&M is about the best. i have always felt that there was a serious lack of boyswear compared to girlswear. it is always very limited and the styles are often a bit samey . I have to agree with you,I have a son and a daughter and find i can buy loads of clothes for my daughter but when it comes to my son i struggle.Shops seem to have a massive section for girls but boys its seems just a little corner. Dont know if its me as well but i find its same for toys,Do all different ranges of dolls and what nots but boys its so difficult. Boys clothes have always been less exciting and plentiful than girls. When my daughter was younger I used to buy tons of clothes cheap very year in the sales and there’s never anything left in the boys! Perhaps it’s because there are so many more decorative things you can do with girls’ clothes than boys. I don’t find any problem in getting nice clothes for Flynn (2) or Conor (11) really, but there probably is less choice, I have a 3 yr old girl too (Melody). For me that’s a positive! Less things to tempt me with!! I find I can get everything I want easily for all 3 in H&M and GAP outlet. I think boys care less about what they are wearing. For my son, putting on clothes is an inconvenience which takes him away from what he is doing. Regularly he puts his tops on the wrong way round and when told his response is “It doesn’t matter”. He had his shorts on the wrong way round most of the morning but it didn’t bother him as he was careering round the garden on his scooter. Recently I’ve been getting special one off outfits for my son from the River Island boys range, they are nice quality but not a huge amount to choose from like everywhere on the high street, it drives me mad. It has been the case for at least 30 years when my boys were babies where there was rails and rails of girls clothes and one little section for the little boys, I really dont know why but its about time it changed.